(Trent Nelson | The Salt Lake Tribune) BYU players on the sideline in the fourth quarter as BYU hosts Northern Illinois, NCAA football in Provo, Saturday Oct. 27, 2018. 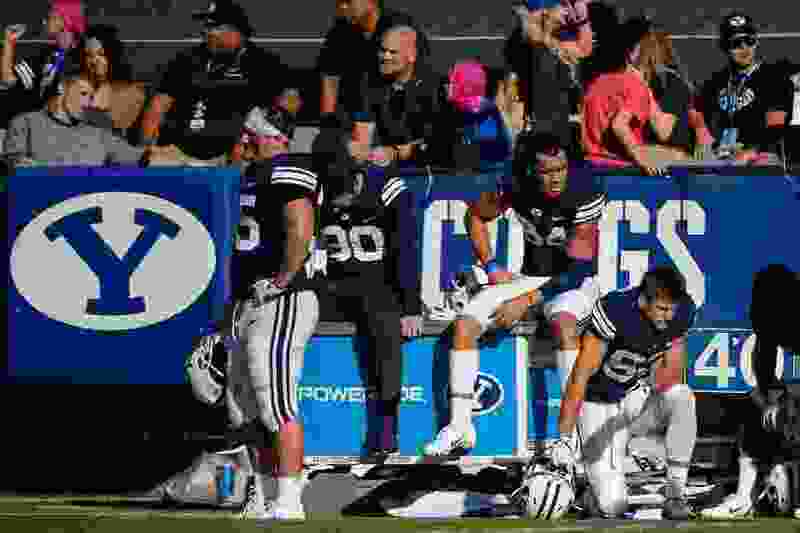 Provo • Special teams have generally been solid for BYU this season, but on Saturday in a razor-close game against Northern Illinois when every mistake was magnified, they let the Cougars down. The result was a 7-6 win for the visiting Huskies, who got a sensational game from punter Matt Ference to help spring the upset. NIU’s defense also played well, holding the Cougars to no touchdowns, just 301 yards of offense, and 3 of 15 on third-down conversions. Ference punted nine times for a 46.8 average and pinned the Cougars inside their 1-yard-line on one punt in particular. “Their punter kicked the ball really well on that [final punt to put BYU at its own 33] and he had a great game punting, an average of 46.8 yards,” BYU coach Kalani Sitake said. “He flipped the field for them and did a good job and pinned us deep a couple times. That was a difference-maker for them. He was able to make some plays for them and put them in better field position. Perhaps the biggest special teams mistake was made by BYU’s kickoff guy, Andrew Mikkelsen. He booted the second-half kickoff out of bounds to give the Huskies excellent field position at their 35-yard line, and they used it to score their only touchdown of the day. Skyler Southam booted 36- and 22-yard field goals for BYU’s only points, but missed a 51-yarder that would have given the Cougars the lead with just more than nine minutes remaining. The attempt came after quarterback Zach Wilson was sacked for a 4-yard loss that made the kick even more difficult. But give a ‘D’ grade to the special teams, which failed the Cougars on day they needed them to shine. • Freshman kicker Skyler Southam misses 51-yard field goal. • Punt returner Michael Shelton muffs a punt and loses 13 yards before recovering it. • Andrew Mikkelsen boots the second-half kickoff out of bounds and gives NIU good field position at the 35-yard line. • The Cougars fail to call fair catch for a punt and it trickles out inside the 1-yard-line.